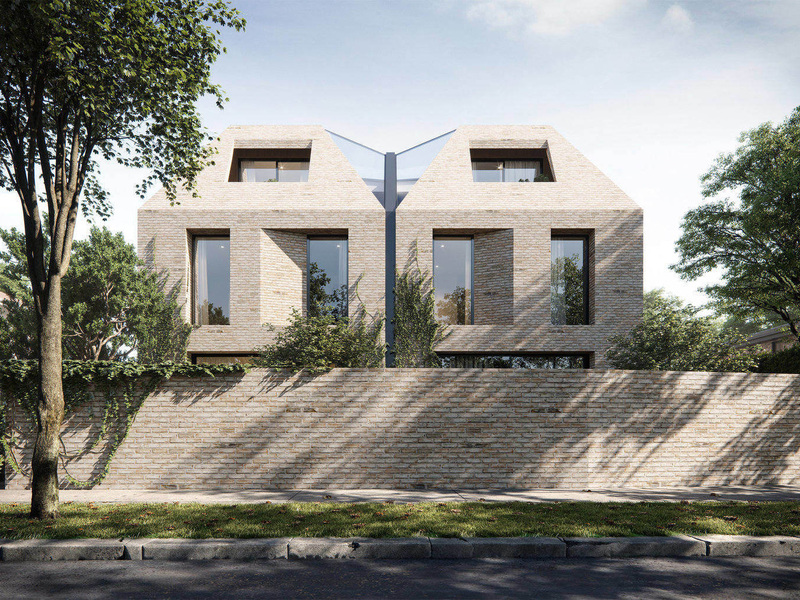 Eight individually crafted Tate Modern-inspired townhouses are planned for the Sackville Ward precinct in Kew, an exclusive inner city suburb in Melbourne. Designed by Cera Stribley Architects, Tate will feature handmade bricks, fluted glass features, brass trimmings, traditional proportioning and symmetry throughout, including meticulously crafted joinery and custom-designed wardrobes from Poliform. A collection of three and four-bedroom homes ranging in size from 230sqm to 287sqm, over half of the residences dedicate an entire top floor to the master suite, with living room ceilings soaring nearly 3m high. According to Domenic Cerantonio, co-director of Cera Stribley Architects, Tate draws inspiration from Kew's Edwardian, angular roof forms. "These angles in the interiors create a confident sense of entry to each residence, really emphasising that feeling of 'coming home'. The brickwork and strong masonry that is synonymous with heritage homes in Kew is something that was important to capture." Distinguishing itself from other properties within the area, Domenic says Tate is larger and better proportioned in terms of width, which ultimately allows for more natural light. ANGLE development manager Marcus Boscarato says no other project in Kew offers the same level of detail and specification as Tate, with developments being few and far between due to the suburb's heritage overlay and tight zoning controls. "Tate has been designed with both downsizers and families alike who either live in the local area or have aspirations to be close to the plethora of private schools that are within a 1km walk from the front door," says Boscarato. "Our approach for these homes has always been with the mindset of an individual who sets out to design an architecturally beautiful single residence on a fabulous block, which has translated into the level of quality that the finishes possess. The Sackville Ward precinct is rich with history, so it was fitting to integrate some of the best, luxurious partners to the area that would respect the distinguished precinct."